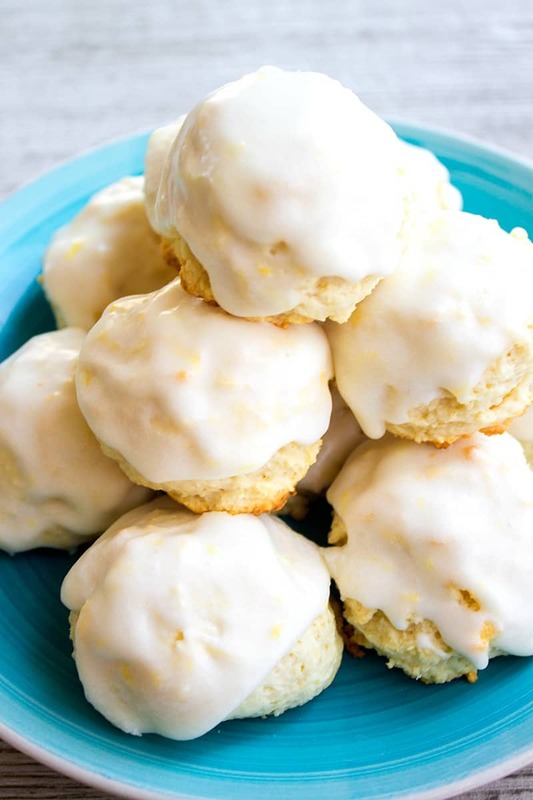 Italian Lemon Drop Cookies are a delicious dessert that’s easy to make and SO yummy! With a big burst of citrus flavor, I bet you can’t eat just one! I love lemon desserts. 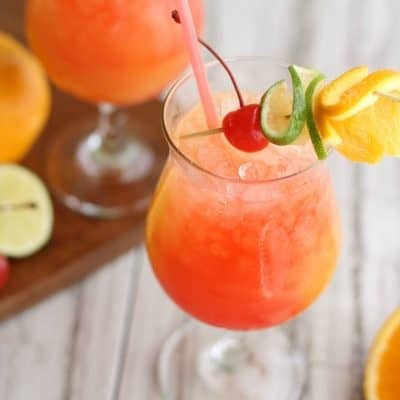 The bright, citrus flavor just makes my whole day better and lights up my mood. I’ve seen lemon desserts done in magically delicious ways and I’ve seen them leave me puckering so hard I thought my face would stay that way. This lemon drop cookie recipe is the former. 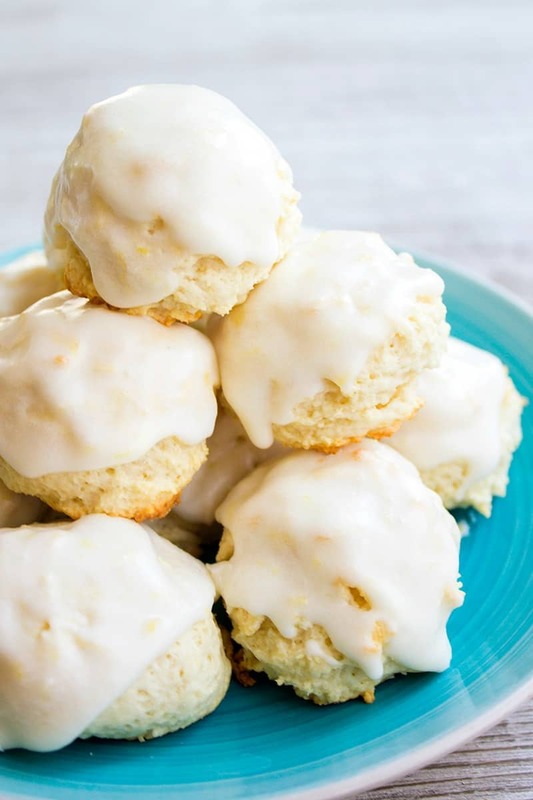 Sweet lemon glaze coats and not too sweet biscuit-like cookie for a perfectly balanced bite of citrus you’ll crave! Baking with my boys is one of my favorite things to do any day of the week. 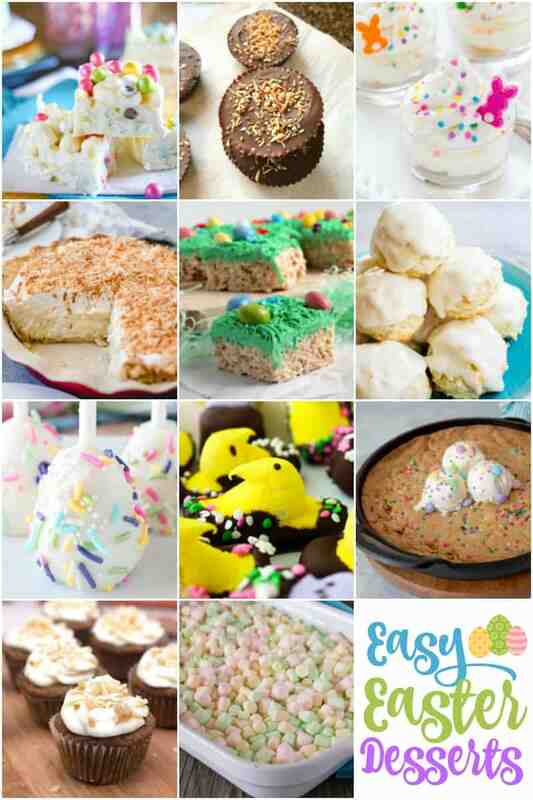 So I’m always on the lookout for easy to make recipes (sweet or savory) that they can help with. 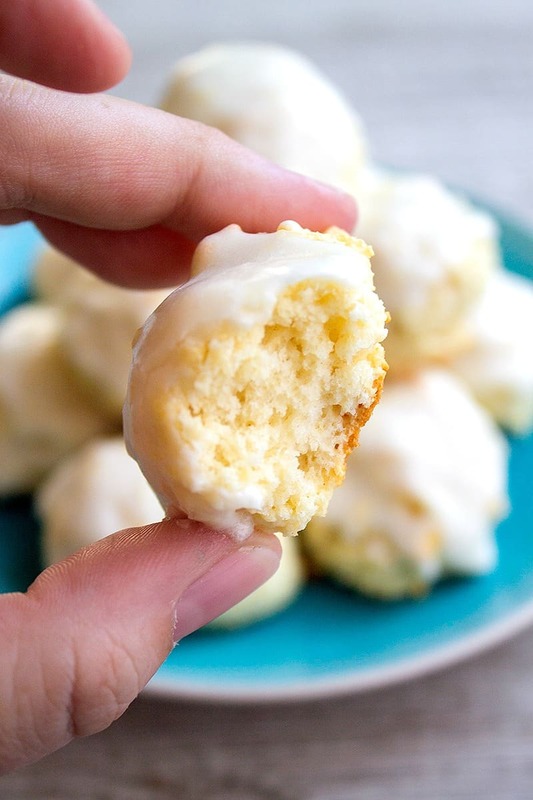 The first time we made these Italian lemon drop cookies we had such a good time that they’ve been in our regular dessert rotation for years. I think they definitely rival the Panera lemon drop cookie recipe for taste, even if the cookie itself is made differently. Mix up the cookie dough. Use a small cookie scoop to place dough on lined baking sheets. Bake until the edges are golden. Whisk together the lemon glaze in a mixing bowl. Dip the tops of your cooled cookies in the glaze and allow the cookies to sit so the glaze can set up. See! Super simple to mix up a batch of these easy lemon drop cookies. Make sure your baking powder is not expired. This will cause the cookies to lose their fluffy texture inside and they could come out hard all around. These “cookies” are basically like mini scones. The flavor of the biscuit/cookie part is a very subtle lemon with a hint of vanilla – it’s not big on flavor. The big lemony punch comes from the glaze, so don’t skip icing them!! Using a small cookie scoop, you should get 2 dozen plus cookies in a batch. This can vary depending on the size of your scoops. One of my favorite things about these cookies is the texture. The outsides are firm, but the inside of the cookie is light and almost cakey. I’ve been known to eat a handful of them in one sitting. They’re a fantastic little bite any time of year, but I especially love them in the Spring and around Easter time. Combine flour, baking powder, and salt in a medium mixing bowl. Set aside. In a large mixing bowl, beat together the butter and sugar for 1 minute or until pale and fluffy. Add the egg and vanilla to the butter mixture. Beat until combined and smooth, scraping the sides of the bowl as needed. Add the lemon juice and lemon zest and mix to combine. Add half of the flour mixture to the butter mixture and mix until just incorporated. Add the milk and mix to combine. Add the remaining flour mixture and mix until completely incorporated. The dough should be the consistency of a very thick, sticky cake batter. Use a small cookie scoop (about 1 tablespoon) to portion the cookie dough onto parchment paper or silicone mat lined cookie sheets. Bake for 11-13 minute, or until the bottom edges are golden brown. Carefully remove from the oven. Transfer the cookies to a wire rack to cool completely. In a medium mixing bowl, beat together the powdered sugar, butter, milk, lemon juice, and lemon zest until smooth. Place the wire racks (with the cookies one them) over some foil or over a baking sheet. Serve immediately or store in an airtight container until ready to serve. If you glaze looks too thin, you can add more powdered sugar a tablespoon or two at a time. If it looks too thick, add milk a teaspoon or two at a time until your desired consistency is reached. This is a glaze, not a frosting, it should be on the runny side. You can add more lemon juice and zest to the glaze if you prefer a stronger lemon flavor. If you like, you can drizzle or spoon the glaze over the cookies while they're sitting on a wire rack. I usually dip the tops and put them back on the baking sheet to set up. I’m assuming there is a typo. Does the 1/2 cup of milk go into the dough and not the glaze? Hi Elizabeth! YES!! The 1/2 cup milk should go into the dough. Thank you so much for catching that and letting me know! I’ve updated the recipe card. Hi Patty! I haven’t frozen these cookies, but you should be able to freeze the cookies once they’re baked.Then just let the cookies thaw out before glazing them. Hi Patty! I use 2% milk because that’s what I usually have on hand, but 2% or whole would work. These are my new favorite lemon dessert! I used lemoncello In both the dough &. Glaze instead of the juice or extract & topped with grated lemon peel…….DiVIVINE!!!!! Oooo limoncello sounds like a fantastic addition! Good call Julie!! I am responsible for the “Lemon Bar” stand at my sons wedding… he wants like a lemonade stand with all his fav lemon deserts instead of a grooms cake. I think i will add these cookies to the list..
I’m currently updating this recipe (like today) to boost the lemon flavor in the cookie itself after reader feedback. If you want to give me a couple days to get the revised recipe up I’ll have it for you! Hi again Cheryl!! I just updated the recipe. I also wanted to update you on the quantity. Today when I made the lemon drop cookies (I did two different batches) the recipe yielded just over two dozen per batch. I’d say you can absolutely get away with making 4 batches of the cookies to hit your 8 dozen goal. Also, the glaze recipe is enough to do 2 batches of cookies, so you’ll only need 2 batches of glaze. Happy baking!! These look delicious! Pinned to my baking this year board! I can’t get enough lemon or lime anything and am excited to give these a go. Seem like even an occasional baker like me could pull these off. Why did my cookies come out flat? Hi Celina! Without being in the kitchen I can’t say for sure, but the first things I would check are that you used baking powder, not baking soda, that your baking powder isn’t expired, and that the cookies have a thick, sticky dough like texture vs a looser batter before scooping. Hi! Can I use light cream instead of milk? Hi Holly! Are you talking half-n-half or whipping cream? I think you’d be okay to substitute, but there is a higher fat content in cream and it could change the cookies a bit. It’s no biggie to sub it out for the glaze. Hi Julie: Just made these tonight and loved them!!! This recipe is a keeper. Thanks for sharing. Dumb question. Do these get stored in the fridge or can I leave them out? I keep mine in the fridge, but you can leave them out in an airtight container for a day or two if needed. I just saw your recipe for the Lemon Drop Cookies. It is 1/1/2019. Is the latest version of your recipe. I had already made my cookies before I saw your recipe but would like to try it the next time I make them. Does your latest recipe call for one tablespoon of baking powder and 1/3 cup of milk? Hi Sandy! Yes, the current iteration has 1 Tablespoon baking powder and 1/3 cup milk. Happy baking!! Made these for Christmas. They were a hit!! Made again for me minus the glaze as I have to watch my sugar. There are still delicious. Hi Diana! The reason for the unsalted butter when baking is so you can control the amount of salt in the recipe. If you used salted butter, you’re getting the amount of salt they put in the butter (which you don’t always know). Unsalted butter lets you add salt in the amount that’s correct for the recipe without the butter making things wonky. 🙂 Hope this helps clear things up! PS – If you have salted butter, it’s usually about 1/4 teaspoon per stick (1/2 cup) of butter. Hi Diana, I don’t have a cookie scoop, will a small ice cream scoop work as well? Hi Toni! Not sure who Diana is, BUT I’d use a heaping 1 tablespoon measuring spoon. If your ice cream scoop is about that size you absolutely use that instead. Hope this helps!! So sorry Julie about the name mix up, I have been reading so many recipes I got you mixed up with someone else, haven’t made these yet but will attempt them today, thank you for the feedback, nice to know I can use your site and ask questions if I need to…thank you again! Hi Whitney! You will not need as much lemon extract, and honestly, it doesn’t taste that same. If you want to give it a shot, 1 Tablespoon lemon juice = 1/2 teaspoon lemon extract. I just made these for a baby show and they rock! so easy to make. I also checked with my mom who is Sicilian and if anyone knows Sicilians we love lemons and love cookies. :)…. and when I read the ingredients to her she said the only thing she would omit is the salt.She just doesn’t put it into her cookies thats all. They turned out great. I made a practice batch and gave them to my kids teachers and afterwards they came up to me to say “thank you” and “yummmy”….So I made my 2 batches for the baby shower. Thank You!